They are giants in the sky but amphibious and purpose-built to haul more water and fly farther to douse fires over sprawling lands. One is the Russian-made Beriev Be-200 and it is designed to carry up to 37,200kg of water and fly up to 3,850km without refuelling. The other is the CL-215 from Canada, which is smaller but still packs a punch in terms of its flight range. 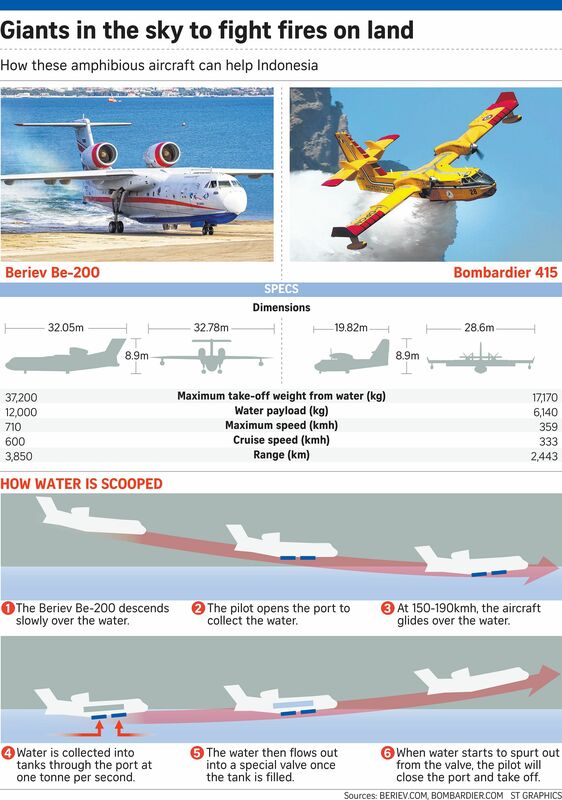 Russia has agreed to offer Indonesia a Beriev water-bomber, but talks to land the aircraft from Canada had stalled. Indonesia believes these water bombers can be game-changers in its fight against forest fires raging in Kalimantan and Sumatra, and had initially wanted Singapore and Malaysia's help to acquire them. "These amphibious aircraft can fly then land on a river, lake or sea to scoop up a very large amount of water and then take off again to douse fires over an area of between 1ha to 1.6ha. So, with just one strike the fires are gone," said Dr Sutopo Purwo Nugroho from Indonesia's disaster management agency (BNPB). These aircraft have a solid track record in firefighting operations across Europe and North America. The Straits Times understands that the Republic of Singapore Air Force does not operate the two aircraft identified by the BNPB. However, the Malaysian Maritime Enforcement Agency has the Bombardier 415, which is a newer variant of the CL-215, but Kuala Lumpur has yet to receive a request for the aircraft from Jakarta. Malaysia and Singapore were the first countries affected by the haze. Both countries have offered help to deal with the crisis, with Indonesia saying it was considering their offers. Singapore's assistance package included a Singapore Civil Defence Force (SDCF) firefighting assistance team, a C-130 aircraft for cloud- seeding and a Chinook helicopter equipped with a water bucket for aerial firefighting. Malaysia had also offered aircraft. Yesterday, Singapore's Ministry of Foreign Affairs said it is offering another team from SCDF to provide assessment and planning assistance, high resolution satellite pictures and hot spot coordinates. Last night, Foreign Minister Vivian Balakrishnan, in a post on Facebook, said that Indonesia will now take up the offer. In the original article, it was reported that Singapore Civil Defence Force (SDCF) will send a land firefighting team to Indonesia. SCDF has clarified that it is a firefighting assistance team.